The Montecito is a 116-unit, tax credit community for people 55 and over located in the heart of Hollywood in Los Angeles, CA. The waiting list is currently closed. 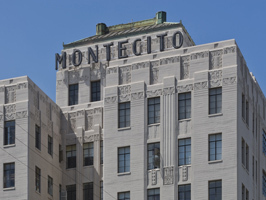 Built in the 1930's as an upscale, art deco hotel, the Montecito was converted to affordable senior housing in the 1980's. Located at the base of the Hollywood Hills, the Montecito provides easy access to parks, shopping and a community center. The Montecito offers studio and one bedroom apartments with heating and air conditioning, full tubs and showers and breathtaking views. The common areas include a quiet garden and an inviting community room with a baby grand piano. Additional recreation areas feature a large screen television, laundry facilities and a treadmill. Resident parking is available on-site. At the Montecito, residents enjoy a variety of activities such as the weekly Sunday coffee group, Tuesday classic movies, Friday contemporary movies, monthly resident meetings, monthly birthday parties and a special monthly events ranging from jazz music, pizza parties, holiday celebrations and homemade dinners. We invite you for a tour with our staff to see this remarkable building which once served as home for such stars as Ronald Reagan, Ben Vereen and Micky Rooney.